What's that? You'd like to snap up your own copy. Well, I'll wait here while you follow this link to Abebooks. Yes, that is £1320.19 for a 1st edition. But all is not lost. This glorious book is also available to download from Project Gutenberg. Ta dah! Now that we all have copies, where to start? Towards the close of my visit to Burmah I was dining one night at a friend's house in Rangoon, when my neighbour ... suddenly turned to me and asked me if it was my intention to write a book. At my prompt reply in the negative he seemed astonished, and asked, what then did I intend to do with my life? ... if, as my questioner clearly intimated, it was the custom for every casual visitor to the Land of Pagodas either to write a book or to 'do something with his life,' my duty seemed clear. I had no desire at all to undertake either of the tasks, but as there was apparently no third course open to me, I decided to choose the safer of the two, and write a book. So far so good, but what to write about? I have considered the merits of unnameable subjects, from the exploits of the old Greek heroes to green Carnations, but each appears to have been appropriated by some earlier author. The only subject which, so far as I can discover, has never hitherto formed the theme of song or story, is Myself, and as that is a subject about which I ought to know more than most folks and which has always appeared to me to be intensely interesting, I have adopted it as the theme of this, my first plunge into Literature. In the 'Bull' [some kind of shipboard game ... like deck quoits, maybe?] tournament I was drawn to play with a Mr. Rod, whom I did not know, but who enjoyed the reputation of being an excellent player, and very keen to win. One morning I was practising, and playing, if possible, worse than usual, when I noticed a melancholy-looking man, seated on a camp stool, watching my performance. I was struck by his ever increasing sadness of expression, and enquired his name. 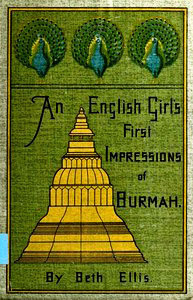 And so she continues: from the ship, to Rangoon, to Mandalay - whose romance was somewhat marred by the party of American 'Globe Trotters' who 'could only satisfactorily demonstrate their complete association with their surroundings, by singing indefatigably, morning, noon, and night, that most un-Burmese song, 'Mandalay.' After Mandalay Beth (we were on first name terms by now) travelled by cart and recalcitrant pony to the up-country station where her sister and family lived, casting a droll eye over everything - and everyone - she meets. It has always been a sore point with the ladies of Remyo that their Club House only contains one room. They argue that if half the members wish to play whist, and the other half wished to talk, many inconveniences (to say the least) would arise. As there are but four lady members of the club, this argument does not appear to me to be convincing, but I do not pretend to understand the intricacies of club life. This is not, the author makes clear, a detailed survey of Burma's history and geography. This is not a book on 'Burmah,' but an account of my impressions of Burmah; therefore, for all matters concerning which I had no original impressions ... I refer both the gentle and ungentle reader to the many books on the subject which have appeared during the past few years. But it is a priceless (in every sense of the word) account of the domestic lives of European women in Asia. Women longing for Home, trying desperately to re-create Home, striving to ensure that the creepy-crawlies and assorted bogeymen stayed in the jungle and didn't cross the thresholds of their temporary homes. After all, not Burmah, but England is looked upon as 'Home'. Even the man of twenty-five years service whose family, friends, and interests may be all centred in Burmah, who loves the life he leads there .... even he talks of what he will do when he 'goes home,' and in imagination crowns with a halo 'this little precious stone set in the silver sea, this blessed plot, this earth, this realm, this England,'.... However happy and prosperous the Anglo-Indian may be in his exile, going to England, is 'going home'. I'm in danger of transcribing the whole book in this post ... but that would probably try the patience of my gentle and ungentle readers. Instead I will finish by saying that I read the book in one sitting. That when I finished I spent half an hour on the phone to my sister in Lesotho explaining that I wanted Beth Ellis to be my new best friend. That I have been scouring the internet for information about her. But that's a story for another day.